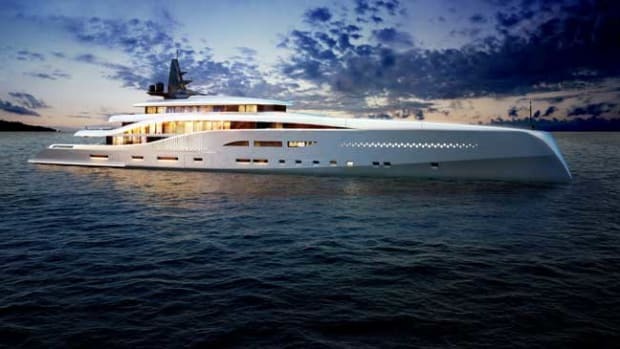 Construction on 357-foot (108-meter) Project Tomorrow will commence this year. In the Year of the Sheep, nothing is sheepish about Project Tomorrow. 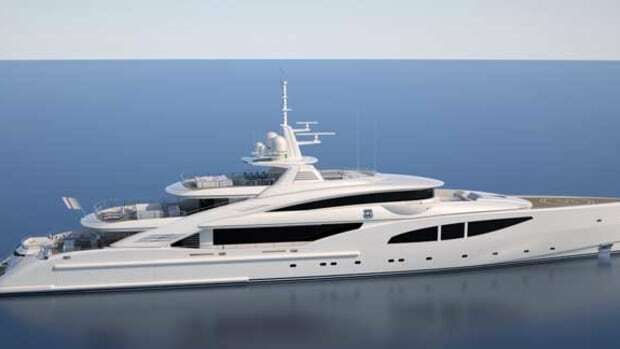 Construction on 357-foot (108-meter) Project Tomorrow will commence this year. 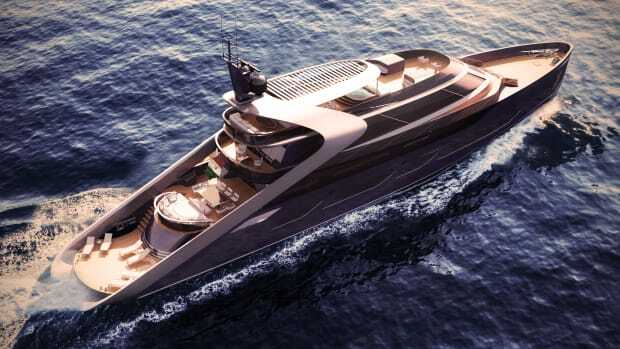 The builder is Pride Mega Yachts, a division of CIMC Raffles based on China’s Yantai Peninsula in the Bohai Gulf. 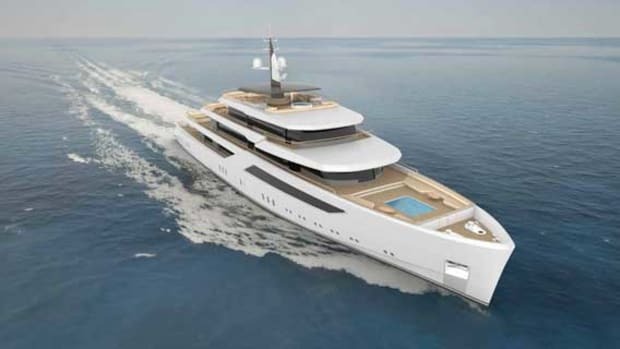 Since re-launching its brand at the 2013 Monaco Yacht Show, the yard has invested more than $3 million in its facilities, including a 52,000-square-foot space that includes new sheds, offices, workshops and stores. 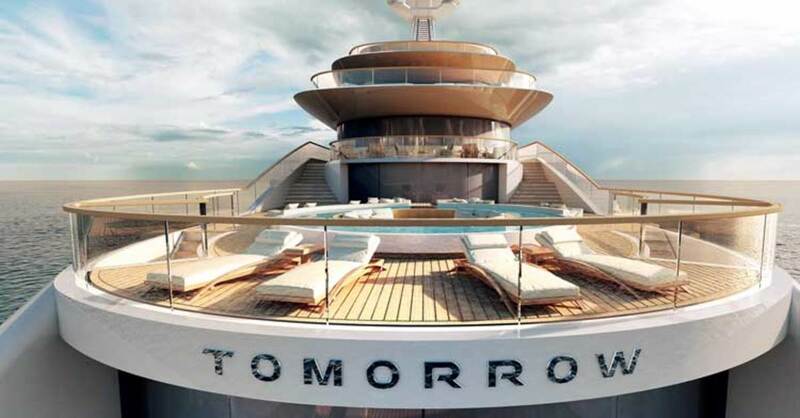 Project Tomorrow was introduced at the 2014 Monaco Yacht Show. 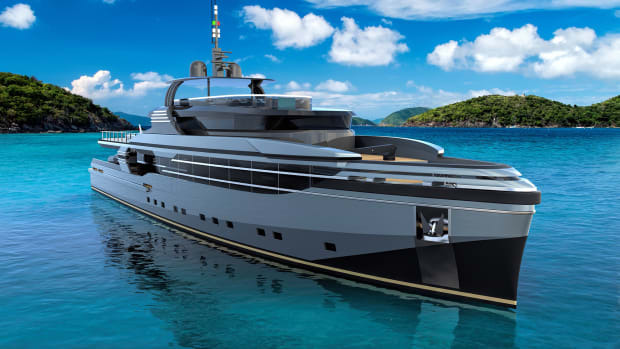 With exterior and interior design by Sinot Exclusive Yacht Design and naval architecture by Azure Yacht Design & Naval Architecture, she promises to be a true conversation piece. At 4,800 gross tons, she will yield an incredible volume. The overall design—signature Sander Sinot—is modern and contemporary. 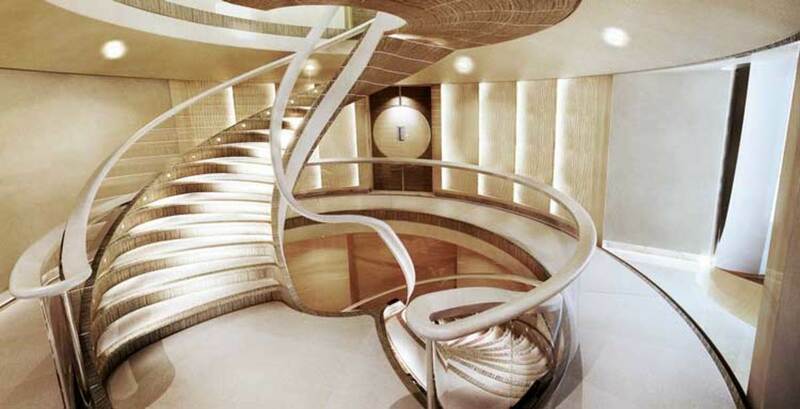 The interior’s focal point is a nautilus-shell-shaped staircase connecting all decks except the sundeck. 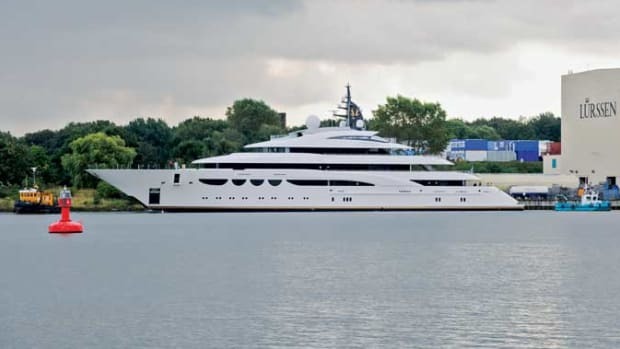 Curved floor-to-ceiling glass on the top three decks of the superstructure provides unobstructed views, and sliding glass doors allow for easy traffic flow inside and out. Bleached walnut paneling enhances the interior’s brightness. 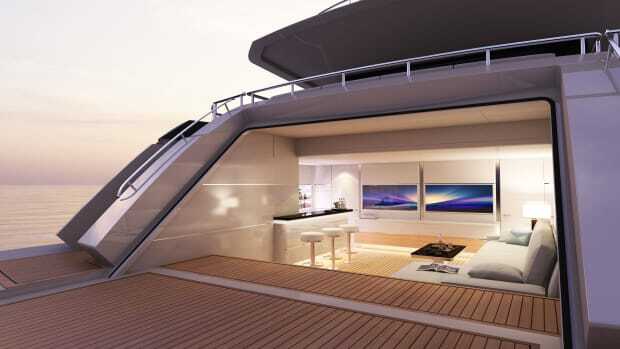 According to the designer, the interior aesthetics are meant to foster a close relationship with the exterior decks for a seamless look and feel. 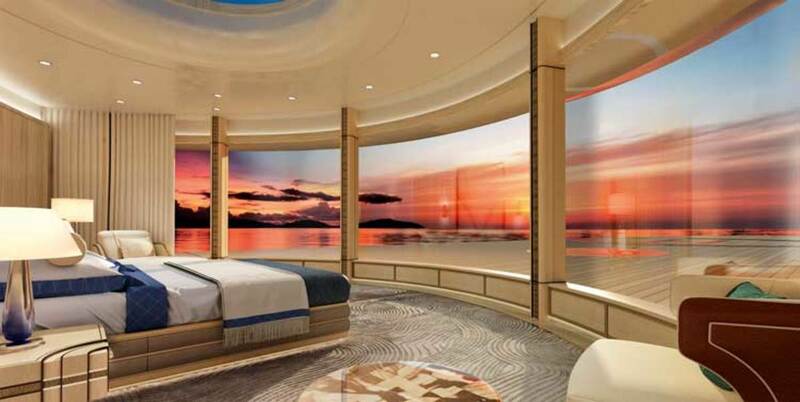 Owners can choose accommodations plans for 19 to 26 guests in six to eight cabins, with two to four VIP staterooms. The owner’s suite is on a private deck with floor-to-ceiling windows and a circular skylight flooding the stateroom with natural light. 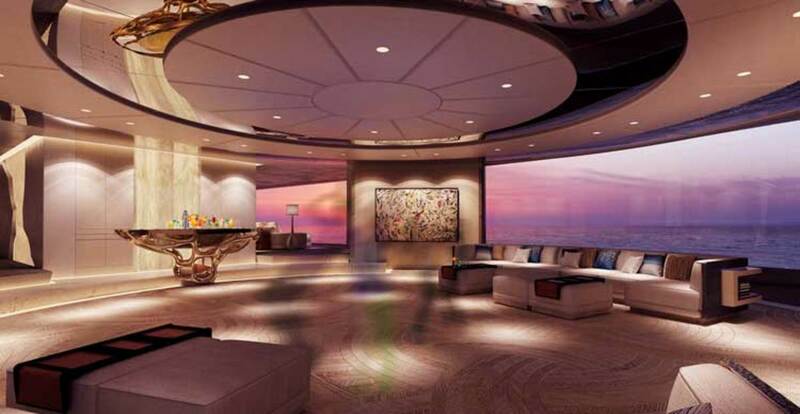 The owner’s aft-deck lounge sports a dome in the ceiling. Outside on the main deck is a circular pool with recessed seating. 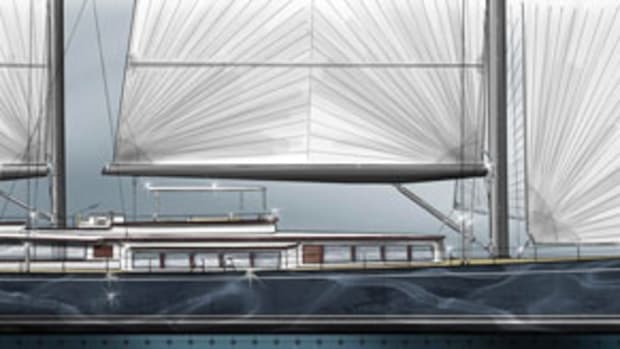 The aft deck has a swim platform with ingress to the beach club. 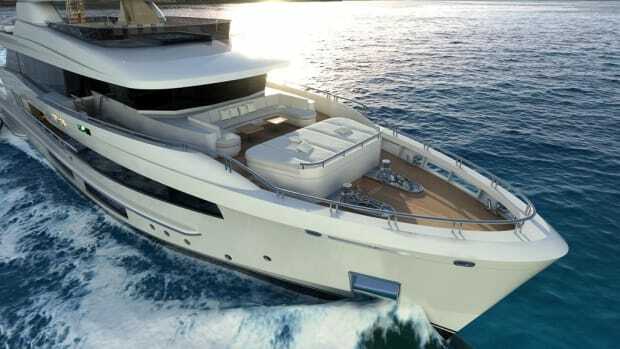 Twin MTU 16V 4000 M73s are expected to generate a 14-knot cruising speed. Top end is 18 knots, and range is 5,000 nautical miles.